Where can you find a piece of the Berlin Wall, a cannon ball mounted on a Conestoga wagon hitch, and over a hundred lions looking down at you from the tops of Baltimore’s buildings? On our Downtown Landmarks and Lions tour, of course! 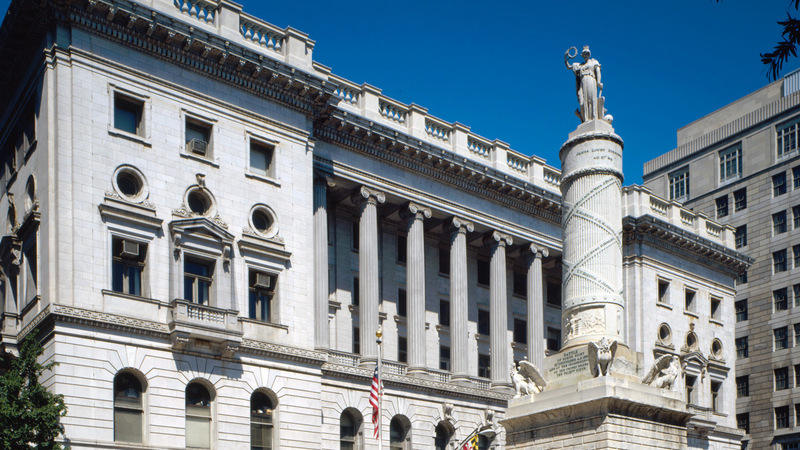 In this leisurely stroll—we cover a little over a mile in a little over an hour—you’ll see and hear the highlights of downtown Baltimore’s history and architecture. Best of all, you’ll discover where all the noble lions, hellish fiends, and neo-Egyptian sphinxes are hiding—the trick is in looking up! If you are Baltimore born-and-raised or a visitor from out-of-town, you don’t want to miss this Monumental City walking tour! Our new Monumental City tours are guided walks exploring iconic Baltimore landmarks in Downtown, Jonestown, Mount Vernon and Patterson Park every Sunday from April through November. Support for this tour series is provided by the Baltimore National Heritage Area and Maryland Heritage Area Authority.